If you’re not even sure what an opener is, don’t worry about it. We’re here to help. Have you ever wondered how those automatic garage doors open and close so easily? They make use of a motorized device which makes it all happen - that's the opener, the brain behind your system. 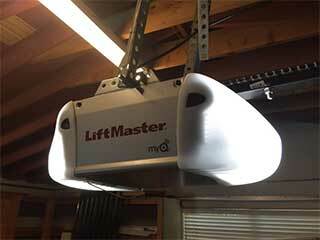 Do I Need A Garage Door Opener? Strictly speaking, no, you don’t need one. However, it is extremely convenient to have one - automatic doors have become the norm today in American society. Convenience aside, an automatic door offers you a sense of security. If you’re getting home on a dark night and feel a bit uneasy about getting out of your car to open your garage. With a well-functioning opener, there's no need to worry - it'll open up with just a touch of a button. How Do I know Which Brand To Choose? We stock all the most popular and trusted brands of garage door opener. If you're looking to purchase your first unit or wish to upgrade your current system, you'll need to check that the new opener fits the weight and horsepower needed for your door. When choosing a new opener, it's also important to consider the drive type that's best for you. Chain drive units are a popular choice for those looking for affordability and reliability. For near silent operation, belt-drive models take preference while screw drive openers are best for those who wish for as little maintenance as much possible and don't mind a little noise. We can guide you through all of the opener choices available and help choose the right one for you. Our friendly and technically savvy staff are on hand to assist in any way possible to ensure you're happy with the service you receive. Whether you're in need of a new unit or need troubleshooting assistance, our technicians in Connecticut are on hand to help.